A little over ten years ago, a group of people who were students or admirers of W. Edwards Deming decided to create an event that would honor the teachings of Dr. Deming here on the West coast. I am not privy to all the details of its genesis and they aren’t really all that necessary to this post, but I do want to provide a bit of context, as I’ve never before written about this event in this venue. I stopped attending for several reasons, not the least of which was I had to start paying for it out of my own pocket. I’m essentially of the opinion now that I should have continued to attend, despite the extra expense, but I guess I wasn’t thinking all that clearly for the last couple of years. It is not an exaggeration to point out my “retirement” has knocked me for more of a loop than I anticipated when first I decided to accept the severance package offered to all employees who were 60 or over, back in the first quarter of 2010. There were numerous reasons – besides the cost – I made the choice to not go in 2010 and, again, they were likely pretty stupid or silly, but that’s spilled milk under the bridge 🙂 . Suffice it to say I’m very glad I went this year. Among other things, I got to meet, talk to, and have a picture taken with the Dean of the United States Military Academy, West Point, Brigadier General Tim Trainor. General Trainor gave Saturday morning’s keynote address and responded to questions afterward. One of the questions was from my friend Steve Brant. Frankly, I don’t remember his question but I do remember the answer included a somewhat sheepish apology for injecting a sliver of politics. It was this apology I addressed with him afterward when we had a moment to speak. What I said to him was, essentially, that I thought it was time to start talking a little more politically; not in support of any politician or specific policy, but more in an effort to build dialogue and respect for diverse opinions. Unfortunately, discourse in this country has sunk to the level of pig-headed name calling and the delusional belief there is only one answer to any question (and it’s mine). This is a recipe for disaster, especially the latter belief, in any endeavor and surely with respect to the national discourse. And though I hope I might have the chance to discuss it again with him (hopefully on [his] campus 🙂 ), and I will write about this subject again as well – probably numerous times – it’s not the point I wanted to convey here. That’s far simpler and less contentious, I think. I attended an all-day, pre-forum workshop based on Barry Oshry’s Organizational Workshop. It was the third time I’d attended this workshop and it was led by a former colleague and dear friend. There were several other sessions conducted that day and we all started out together in the Leadership and Learning Center* at PWR’s Canoga Ave. campus. One of the participants/presenters was Col. (Ret) Debra M. Lewis and, just before we split up into our separate groups for the day’s activities, she said something that stuck with me the rest of the weekend. She pointed out that, unlike many other conferences, forums, seminars, symposia, etc. she had attended, her being a little late wasn’t met with anything other than warm welcomes, hugs, and appreciation for her presence. As I said, that comment stuck with me and, when she and her husband LtCol (Ret) Douglass S. Adams shared their experiences on their year-long Duty Honor America Tour, I realized how much I had missed out on by not attending last year and by not remaining in touch with my former colleagues and so many friends I had grown close to over a career that spanned a little over 23 years. As well, it reminded me these are very special people. There is no person who makes it to the In2:InThinking Forums who hasn’t become aware of the systemic nature of organizations and life itself. Every one of them is also a kind and compassionate soul who cares about the impact they have on their places of work, their families, and their communities. None of them are there primarily to sell a product or service. They come to share. If they’ve written a book they bring some, but it’s not their primary purpose. These are leaders and teachers. I’m very lucky to have been a part of the journey with them, and now look forward to many more years of positive engagement. I’m also slowly realizing the process of “retiring”, which has entailed an awful lot of refocusing and not a little concern over how long I’ll remain sharp and capable, has affected me far more deeply and in more ways than I apparently cared to think about. So . . . my journey continues and I look forward to gaining a more clear understanding of how I’m coping and what I intend to do to make things interesting and productive. Reflection is good, don’t you think? * It’s worthy to note this center contains, both within and just outside in a patio area, a rather large collection of rocket engines and the parts from even more, including some very historical engines. 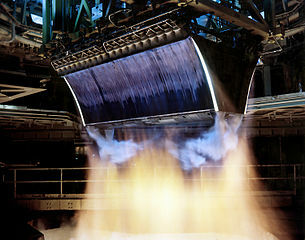 Among these are the SSME, J-2, RS-68, both an annular and a linear Aerospike, and a SNAP-10A nuclear reactor (minus the fuel). This entry was posted on Friday, April 27th, 2012 at 6:15 pm	and tagged with Ackoff, Conference, Deming, Forum, project management, PWR, Rocket Engines, Systems Thinking, West Point and posted in Professional, Systems Thinking. You can follow any responses to this entry through the RSS 2.0 feed.